As we drove into Granada from the Managua airport yesterday, it was as if I never left this extraordinary country just over six months ago. It’s very rare for me to return to a place … I’ve done it internationally in only two places, both in Italy: My Manarola, which is scrawled so indelibly across my soul that I can’t help but return there over and over; and Venice, which calls me back to its canals and antiquity as if I am one of its own, which I have a feeling that I am, back from the courtesan days. But that’s another story for another time. For now, as we drive on, with smoke billowing from the sides of the road where garbage is being burned, to the other side of the road where it is strewn amongst the cows grazing and the children playing, I am touched by my sense of familiarity with this place. The tropical flora and fauna and yes, that tropical heat, too – ahhhh, my body automatically takes a huge sigh of relief when I feel that steamy heat surround me. I may have Mediterranean roots, but the tropics have my heart. And already, I’m learning something new from returning to a place once visited. Even as I look around, knowing clearly and obviously that I am very much in a foreign land, with its own culture and mores and language, there’s a sense of belonging and comfort that’s also available to me. I step right in speaking my learned-on-the-road Spanish that must sound ridiculous to the native speakers, but I make myself understood and that’s what matters. It’s sweet that I can direct the taxi driver to the blue house on Calle La Libertad, knowing exactly where we’re going. It’s sweet that I can point out the churches and the way to the lake and the yummy restaurant stops. And it’s super sweet to me that I sit writing this morning on the leather chaise lounge in the courtyard, where I sat many an hour before, drinking my morning tea from the same mug I used when I was here at Guillermo’s last time. Yes, I love that! 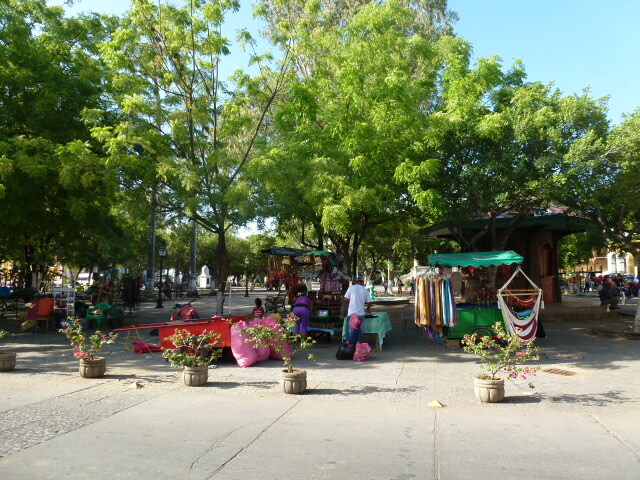 I love that we’re half a block from the city’s cathedral and Parque Centrale, where locals and visitors alike hang out, eat and stay cool under the huge trees that line the park. One block to a place with blind body workers offering massage for $12 an hour (I will be there later today for sure!). One block from Calle Calzada, the walking street where the open air restaurants open up after dark for the evening meal. Around the corner from the Spanish school where I will take daily Spanish lessons beginning this afternoon. In the spring time, I arrived in Granada with a reservation at a Guest House that was undergoing renovation. They agreed I could arrive there, drop off my bags and go about finding another place. Sounded fine at the time, but another place was not so easy to locate. Everything was full, even at low season. I reluctantly agreed to the one room I could find at a nearby hostel. The young folks running the place were very welcoming and friendly, but the room was a dump. For $6, I agreed to take it after my full travel day, trusting I would find something else along the way. I unpacked immediately as is part of my arrival ritual and then headed out to explore. In less than ten minutes, I stumbled upon the sandwich board of “Room for Rent” outside Guillermo’s place and he happened to be walking by inside as I peeked in. 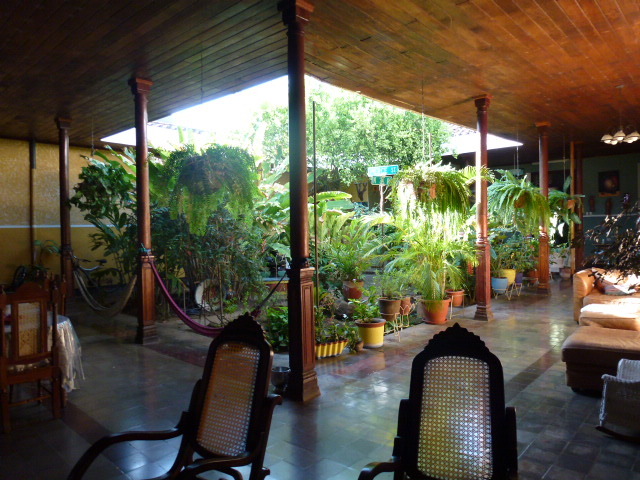 What I saw then is where I sit right now: an old colonial house with a front room filled with white wicker furniture that opens to a huge square-shaped outside courtyard overflowing with tropical plants and foliage. In the back of the courtyard are the bedrooms, dining room and kitchen. The tall wooden-ceiling, tile-floored courtyard is filled with sitting areas of more wicker furniture, overstuffed leather couches and chairs, inviting hammocks, warm breezes wafting through and small birds flying around. I ran right back to the yucky place, packed my things back up in a hurry and moved right into Guillermo’s. I was home. And now I’m home again. We’re all unpacked, settled in, the 5-gallon container of drinking water has been delivered and set up for us and we’ve been welcomed by Jenny and Marina, the two women working here while Guillermo is back in the US. And get this, there are no other guests here – we’ve got the whole place to ourselves! Okay then, I like it, I like it! Our bedroom has three very tall, double, dark wooden-door entrances and we open them all upon our arrival, letting the cross breeze cool us down. The fans help, too. No, no air conditioning and no hot water here – it’s the simple life here in Granada, just how I like it. I give Donna a tour of the house and we head out to explore the town, some on foot and some courtesy of the local one-hour, horse and carriage ride that takes us all over the city as dusk descends and the twinkling lights of Christmas trees from people’s homes attract our attention. It’s easy … everyone leaves their front doors wide open as they sit around talking together. There’s nowhere to go, there’s nothing to do; they’re just visiting with one another. And everyone’s house is wide open – we can’t help but look in and see that while their lives are simple and their furnishings basic, Christmas trees are everywhere. 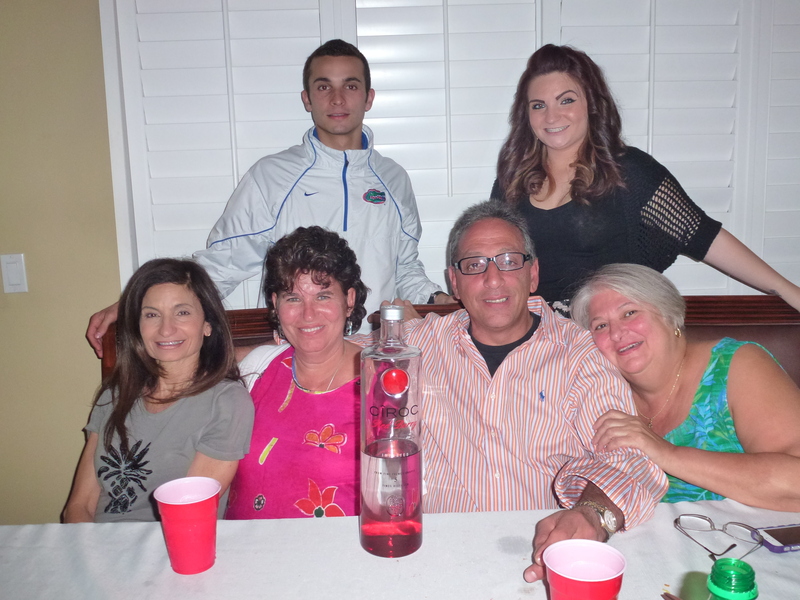 This was the very best time I have spent with extended family in my entire adult life. It’s true, there’s no hyperbole here. What made it so? Humor, of course, plenty of that. I laughed like I haven’t laughed in forever. And I got to be me, showing up as who I am and being seen and valued for that. I didn’t have to hide, I didn’t have to apologize, I didn’t have to make myself small or invisible or palatable to what is expected or preferred. And he did, too. There was room for all of us to be ourselves; and simply put, that’s not an experience I’ve known in my family. How do I say Thank You for that, Stephen? Stephen also introduced me to his dear friend Naomi who came down from New York with him; his high school sweetheart with whom he has remained friends all these years. She and I enjoyed a most unexpected connection that delighted us both. 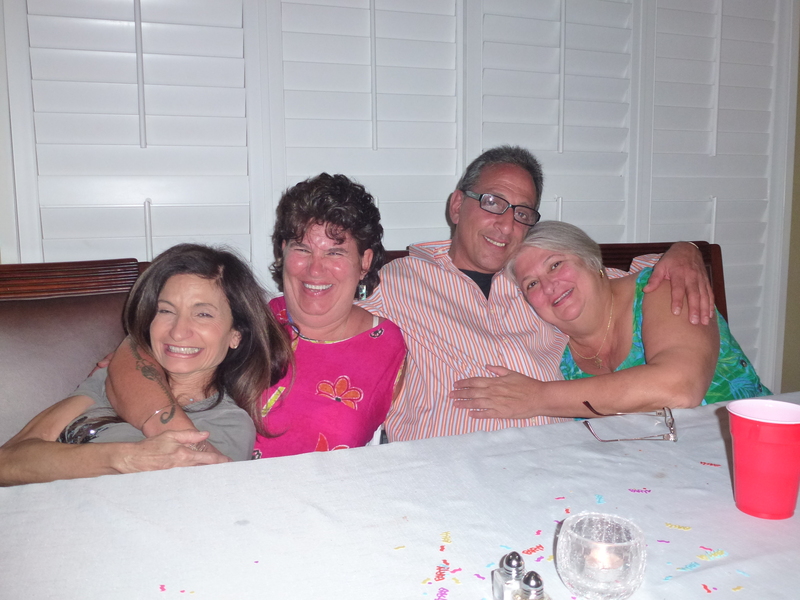 And then he brought me together with another of our cousins, Linda, daughter of my father’s brother – we walked into her house and as soon as our eyes met, tears flowed from both of them as we looked upon each other, dear childhood friends who hadn’t seen one another in over 30 years! Yet another over-the-top evening reminiscing, imbibing in gargantuan amounts of food and drink and meeting the next generation, two of her four amazing children! Young people who are funny and engaged and finding their ways just like we did. At one point at her house, as we sat back down at the dining room table, this time for dessert, I looked around the table and saw not us sitting there, but the prior generation — our mothers and fathers and aunts and uncles, almost all of whom are gone now. It was as if their auras were floating above us, it’s as if we were sitting in their seats. And then I looked at Cayla and Colby, Linda’s two adult children, and they were sitting in the seats we had occupied all those years ago. And here I heard some of the adults saying the same things that those adults had said all those years ago. And here we were, engaging in the very same rituals our forebears had done, eating the very same kinds of food and carrying on traditions of connection that would have made our parents happy that we were choosing to do so. I’m not sure I can describe how clear this all was, but it’s as if I could see this entire familial process unfolding right there at Linda’s dining room table. 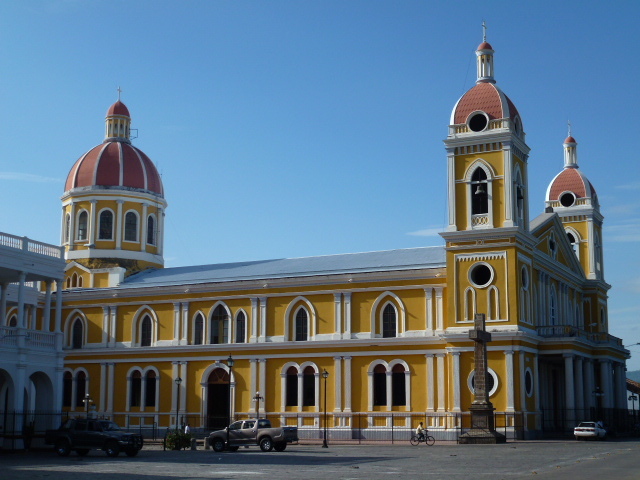 And now, although not so far away by air, far away from that table and from life in South Florida, I sit in a familiar city in a new country — Granada, Nicaragua. I’m mostly rested up after three days of hardly any sleep and now I’m ready to embrace this new leg of travel adventure. This is a new one in another important way for me … this time my sister is traveling with me. We’ve never done this before and I’ve never traveled with someone else (except for a partner). Oh sure, I’ve taken vacations with others, but that’s something else entirely. I don’t feel like I’m on vacation and don’t feel like I have a life to even take a vacation from. I do what I think of as traveling, being on pilgrimage, on sojourn. It’s a different way to be out in the world for me and I’ve so appreciated my ability to step up and into the world and find home everywhere I go. But I’ve done that almost exclusively by myself. This is new for me and certainly new for my sister who hasn’t taken extended time off and generally hasn’t chosen to travel quite in the way I choose. So there are all kinds of opportunities and challenges and experiences ahead for us, individually and together. We shall see how we navigate those byways and find our ways into whole new worlds within us and around us. Yes indeed, Welcome (Back) to Nicaragua! Let the mystery unfold, let it guide my way, let it show me what I need to know, what I need to hold on to and what I can let go of, and may I open with grace to what it has to teach me. Now, it’s off to that cool shower, a walk, a meal and a massage and then my first day of one-on-one Spanish lessons! It’s great to live vicariously through you in another country again! I agree with James 100%. Sooooooooooooo good to be reading you again. Much love to you and Donna!! Thanks for your sweet words and lovely to have you aboard the Blog Train! Yes, you can stay comfy and cozy right there and I’ll be out here adventuring, writing and savoring it all.